Quilt, Not Quilt: The Afterlife is an exhibition of twelve artists who have turned tattered quilts into reflective and collaborative new forms including paper, poetry, and broadside prints. Participating artists contemplated connections to the original quilts and their makers, focusing on craftsmanship and labor, scarcity and plenty, and stories that can be recalled and stories never to be recovered. Responding to questions of social, cultural, and economic history, the resulting exhibition culminates in a multitude of diverse and unexpected transformations of material, story, and form. 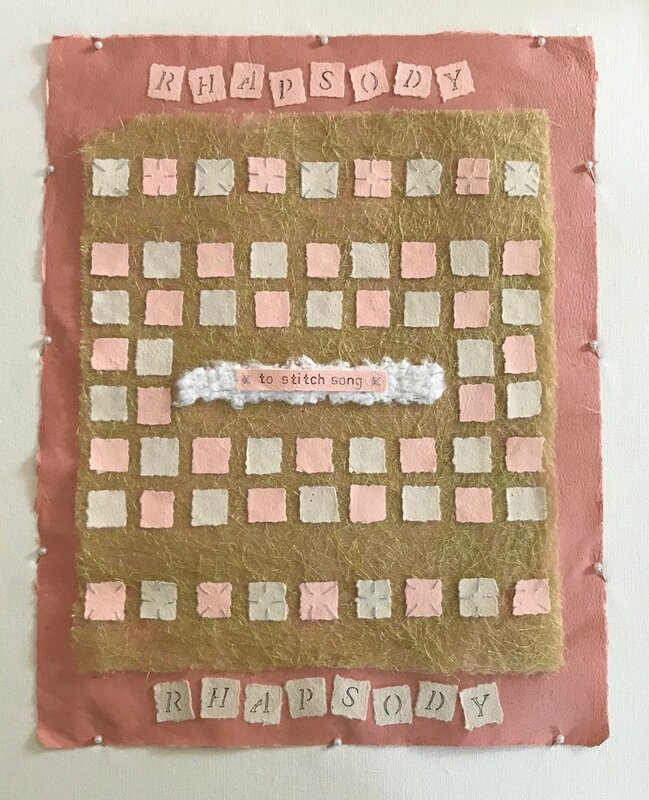 In my research I found that the word Rhapsody has a Greek root: Rhap=To Stitch, Sode=Song. I used pieces of our first test papers for the squares and the final base layer is paper from one of our quilts. The batting is a remnant which was not turned into paper. The thread is silk. The words are stenciled.